Happy Friday everyone! This week sure did fly. I feel like I was just making these pancakes for Rusty yesterday, when in fact, it was last Sunday. We are going to be busy for pretty much the next 6 weekends straight, so I decided to make Rusty pancakes. They are one of his all-time favorite meals (not just breakfast, either. 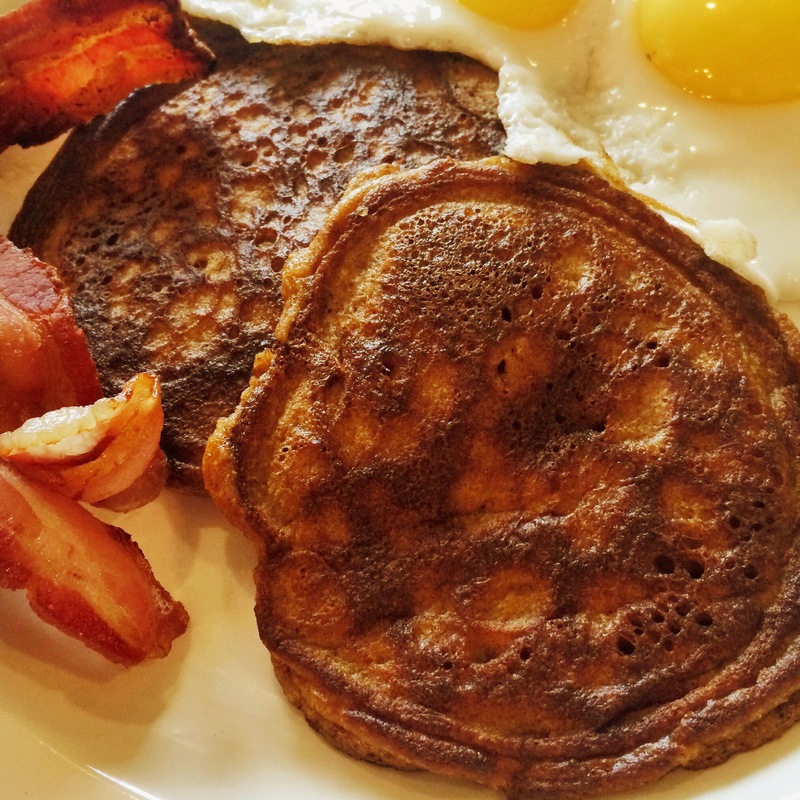 He could eat them any time), and we haven’t had paleo pancakes in ages. Plus I had organic pumpkin puree leftover from when I made THESE scones a couple of days before. So why the heck not, right? So, we sat on the back patio with the pups and enjoyed this wonderful treat of a brunch, enjoying the beautiful Fall weather, and relaxing, which is something I need double time of right now. I have been dealing with chronic neck, head, and jaw pain for about 9 months now, and one of the best things I can do to let my body heal is AVOID STRESS on the body. I’ve got the nutrition component of this down, but the mental and emotional part is a little bit trickier…. but I’ll save that for another post coming soon. So back to pancakes. As I have mentioned before, I love Fall and everything that comes with it. There is a shift in what I crave, and I think this stems back to our ancestors and this idea that they had to eat what the earth could grow in that season, what was most bioavailable, and what their bodies needed based on the time of year. Which means that I am pretty sure my body NEEDS pumpkin, cinnamon, nutmeg, ginger, cloves, butter, and anything maple. It must be science… Well maybe not, but there is something to be said for eating what your body tells you it needs (as long as you understand the difference between craving because of addiction to sugar, insulin resistance, etc. and craving based on nutrient needs). In any case, we are making the shift from bright fresh summer berries to foods like pumpkin, squash, apples, and dark leafy greens (just to name a few). The crock pot will be out in full force, and I can’t wait to get creative in the kitchen. This is my first Fall as a blogger, and I CAN’T wait to have folks to share my recipes with. Bookmark my blog, and come along for the ride! Check in frequently because I plan to post a lot, and it’s only going to get better with the holidays. So without further delay, here are my Perfect Pumpkin Pancakes (I might be biased). They are grain-free and can easily be made nut-free too…. Find notes on all ingredients HERE! blend eggs, sweet spreads, pumpkin, maple syrup, coconut milk, oil, and vanilla in a medium bowl. What are some of your Fall favorites?? Next up for you guys is some amazing pumpkin granola… stay tuned!